Nutty November Offers at Notts off road ! Just thought we'd give you a quick update on our latest offers! Nutty November is back! We'd like to celebrate our nutty nature by offering you our 4X4 GPS Challenge at the fab price of just £50 per person, that's a saving of £10! This offer is only during November and December and is a great price for this extremely popular activity. This is a half day activity, great for corporate days and stag /Hen parties - A very popular event! It involves using some hand held Garmin GPS units to locate various objects around the site, initially on foot until you locate your vehicles and keys.Then you will be shown how to drive the vehicles, and from then on you will be driving those vehicles around to locate further items and complete some simple team building tasks both mental & physical challenges, and also participating in a fun quiz. Please note guests will spend time outside the vehicle doing physical & mental tasks over rough terrain, so dress for weather conditions. We are also offering 10% off all gift vouchers purchased in Nutty November ! 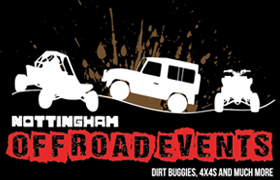 Call us on 01159539865 or email info@nottsoffroad.co.uk to book or buy !